Mark Pringle was a successful athlete and an Iron Man champion (one of the toughest competition on earth) who lost his life in an alleged hit and run reckless accident in Abu Dhabi last year. After one year, nobody was ever found responsible for the accident. His wife, Jennifer Pringle narrates the story of highlights of his life and that unfaithful day. The story is also contributed by his brother Shaughan Pringle. Mark Pringle (6 October 1959 - 31 August 2009) was a wonderful person he was hardworking, generous and an inspiration to many people who wanted to be fit and healthy. In Abu Dhabi he taught hundreds of children to swim and they all loved Mr Mark. He was always full of happiness and enthusiasm. His swim squad was immensely popular and he worked long hours to accommodate all the people wanting extra lessons. Adults and children alike were inspired to get fit and get happy as he used to say. He came to the UAE like every one else to make money, he believed he could make a difference here. Mark devised programs for adults to get fit despite the intense heat of the desert. He was so popular he created Triathlon Middle East and was swamped with offers of work. He had just created a team which was going to compete at an Ironman event in Australia. Mark and I created a team suit which he had made in Australia and he was proudly going to distribute these to his team members to race in. Mark never got to distribute these he was struck down the day before he could distribute them. Mark Pringle died in Abu Dhabi on August 30th 2009. The police ruled the incident as a hit and run accident. To date no one has ever been convicted of this crime and the person who killed my husband remains unpunished. At the time Mark was on Airport Road in Khalifa City riding his bike with two friends. They rode at dawn on a Friday outside the city were there was virtually no traffic. Mark was only missing from his friends for a matter of minutes as they were taking turns practicing fitness runs by dropping back and then catching up to the front . The front two riders had actually stopped on the road and were waiting for him when a car approached them and a man allegedly told them he saw Mark lying on the road. The two riders heard no screech of brakes and saw no lorries on a seemingly empty road early in the morning. The police have never revealed the investigation details to me despite their promises that they were working hard on the case. Mark had only one injury a severe blow to the back of his skull, the wound was so severe Mark was rushed to Intensive care where surgeons tried to save his life. He lay on life support for 36 days fighting a silent battle to live. Marks death was mourned by thousands of people in many countries. He was a sporting hero in Australia one of the legends of the increasingly popular sport, triathlon. 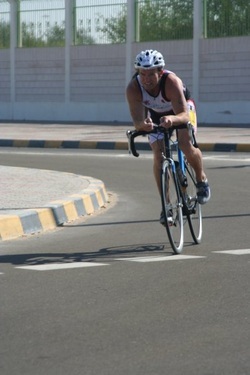 Mark was a competitive triathlon athlete and had raced in triathlon all over the world in over 300 hundred races. He won 31 races (amazing feat for truly competitive sport) and continued to be involved in triathlon when his professional career ended. Mark was also an outstanding surf board rider. He was the first ever Cronulla Board Riders Champion and did indeed win the “Australian Surf Life Saving” Board Display championship in the 70’s. Mark was also a great swimmer and his specialty leg was the swim and he was nearly always first out of the water. He won a state title for Backstroke. Sporting bodies approached him to be the swim director at the Sydney Olympics, the Goodwill Games and the World Triathlon Championships. These were just some of the amazing feats mark completed in his lifetime. He was humble in his achievements and few people living in the UAE knew of his sporting successes. Mark was unique and his enthusiasm for life was infectious. He lived every day to the fullest and went out of his way to make people happy and achieve their goals. Mark worked as a life guard, was a successful athlete, trainer and managed many sports events and bodies in Australia. Some of the highlights of his life are captured in the photos below taken from website dedicated to remember him. According to his brother, Shaughan Pringle Mark truly did live the life of ten men. Mark was only 49 when he died. His life was cut short and no answers have ever been given as to what really happened on the morning of July 24th. He wasn’t just an athlete he was a husband, a father, a son, a brother and friend to many people. Lives have been shattered by his death and unanswered questions. The only real truth there is, is that Mark Pringle was a legend and his life ended on the roads of Abu Dhabi. UAE has one of the highest rates of accident deaths in the world with around 2 people dying everyday and hundreds are crippled for life every year. If you or somebody you know have lost loved one in an accident please share the story with us.